The Milwaukee Brewers closed out their 2016 season with a 6-4, 10-inning victory over the Colorado Rockies at Coors Field in Denver on Sunday. Catcher Andrew Susac clubbed a two-run home run with two outs in the top of the tenth inning to give the Brewers the victory. Prior to his home run, Susac struck out three times and grounded out. 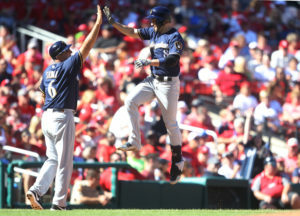 The Brewers had a chance to win the game in regulation, taking a 4-3 lead into the bottom of the ninth, but closer Tyler Thornburg blew a save for a second straight day and the third time in the final week of the season. Jordan Patterson’s rbi single in the ninth spoiled Thornburg’s final game of the season. The Brewers were trailing 3-2 in the eighth when Domingo Santana clubbed a two-run homer to put his team in front 4-3. Both Chris Carter of the Brewers and Nolan Arenado of the Rockies failed to homer in their final game, which leaves them tied for the National League home run title with 41 each. Santana’s strikeout in the fifth inning gave the Brewers the Major League record for strikeouts in a season with 1,536. The Brewers finished with 73 wins on the season, five more than a year ago. The Chicago Cubs started the day with a magic number of one to clinch their first National League Central Division title since 2008. They were ready to celebrate with Champaign on ice, but the Milwaukee Brewers weren’t about to lay down. The Brewers knocked off the Cubs 5-4 in the first game of their four-game series at Wrigley Field and put the Cubs party on hold. It was the first win at Wrigley Field for the Brewers over the Cubs this season. Jimmy Nelson allowed three-runs in six innings, his best performance in several weeks. He improved to 8-14 on the season and picked up his first career victory against the Cubs. Closer Tyler Thornburg came on to get the final four outs to post his 10th save of the season. The Cubs would eventually clinch the Central Division title when the St. Louis Cardinals fell to the San Francisco Giants 6-2 out west. Their celebration will come after today’s second game of the series between the Brewers and Cubs. Chase Anderson (8-11) pitches this afternoon for the Brewers. John Lackey (9-8) goes for the Cubs. 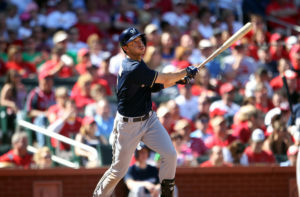 Ryan Braun clubbed his 27th home run of the season, a solo shot in the ninth inning and the Milwaukee Brewers held on to beat the St. Louis Cardinals 2-1, earning a split in their four-game series at Busch Stadium. The Brewers had coughed up a 1-0 lead in the eighth inning on Saturday night and lost 5-1. They led a 1-0 lead get away in the eighth yesterday, but this time Braun came to the rescue. Brewers starter Zach Davies allowed a run on five hits in 7 1/3 innings but wasn’t involved in the decision. Tyler Thornburg came on to record the final five outs to pick up the win. The Brewers scored their first run in the first inning on a sacrifice fly from Chris Carter. That was the only run that Cardinals starter Luke Weaver would allow in six innings. The Brewers have won eight of their last 11 games. They’ll open a three-game series in Cincinnati against the Reds tonight. Wily Peralta (6-9) gets the start for the Brewers. The Milwaukee Brewers batted around and scored four runs in the eighth inning, setting the stage for an eventual 7-4 win at PNC Park. Orlando Arcia, Manny Pina and Keon Broxton all drove in runs against the Pirates bullpen. Arcia finished the game a home run shy of the cycle. The Pirates got two runs back in the bottom of the eighth, but the Brewers would score one more time in the ninth to close out the scoring. Tyler Thornburg closed out the ninth, retiring all three hitters to collect his 8th save of the season. It was the first three-hit game of Arcia’s career. His average climbed from .184 to .204. Brewers pitcher Jimmy Nelson went 5 1/3 innings and allowed a career high six walks, but still held the Pirates to just one run and four hits. 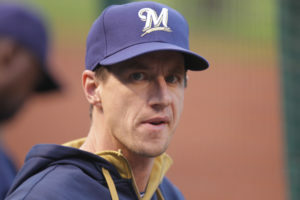 After several close losses, the Milwaukee Brewers finally found a way to reward a starting pitcher for a job well done. Matt Garza held the St. Louis Cardinals to a run on three hits over seven-innings to help the Brewers pull out a 3-1 victory at Miller Park, ending a 6-game slide. Garza coaxed a walk from Cardinals rookie starter Luke Weaver in the third. Jonathan Villar followed with a hit to left and Kirk Nieuwenhuis finished the rally with a three-run home run to right to put the Brewers on top 3-0. The Milwaukee Brewers offense has struggled to score runs of late, but Chris Carter’s three-run home run in the third inning helped knock off the Atlanta Braves 4-3 at Miller Park. The win ended a three-game slide, a stretch where the Brewers managed to score just seven runs. Carter’s home run is his 26th of the season and the 19th at Miller Park. The Brewers have now homered in a season-high 13 consecutive games. Zach Davies allowed just two runs over 5 2/3 innings, pitching the Milwaukee Brewers to a 3-2 win over the San Diego Padres at Petco Park on Tuesday night. Davies (9-4) allowed six hits, walked two and struck out four. He improved to 4-0 with a 1.97 ERA over his last five starts. Carlos Torres threw two pitches to get the final out of the sixth inning, then six more pitches to dispatch the Padres in the seventh. Atlanta’s Julio Teheran struck out 12 Brewers on Tuesday night, but Scooter Gennett made a couple of key plays to lead Milwaukee to victory. Teheran and Brewers starter Jimmy Nelson were locked in a battle and eventually removed with the score tied 1-1. Gennett held the tag on Mallex Smith on a stolen base attempt. A replay challenge showed that Smith lost contact with the base and Gennett’s effort forced an out call. 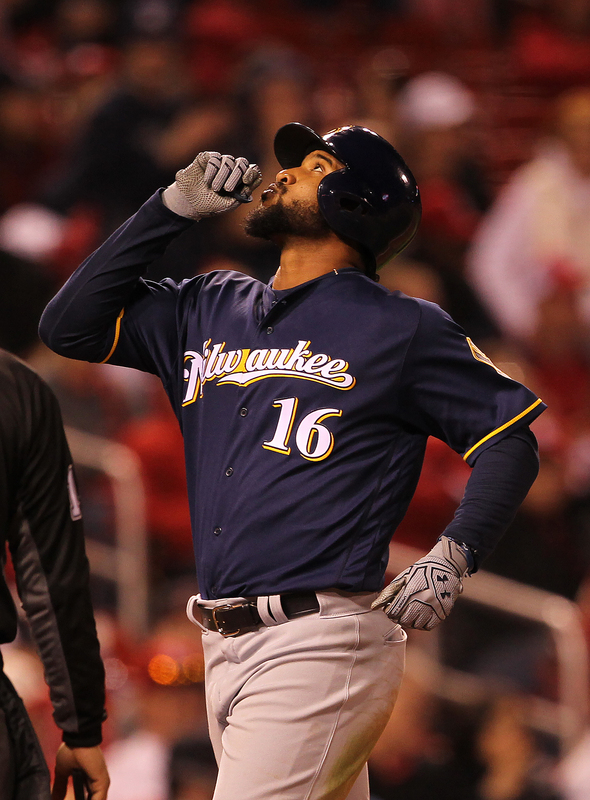 In the 8th inning, with two outs, Jonathan Villar worked a walk, stole second and scored on Gennett’s single to right to give the Brewers the lead and eventually the game. Tyler Thornburg pitched a scoreless 8th and Jeremy Jeffress came on to nail down his 12th save. Ryan Braun gave the Brewers their first run, a home run to center in the fourth. The Brewers ended their three-game losing streak and the Braves fell to two-and-18 at home this season, the worst mark in the majors. Game two of the series is tonight.